In this second installment of the “$1k Ribbon Shootout,” we’ll measure and compare frequency responses across all the mics, and listen to how each one responds to proximity. Finally, we’ll do a self-noise test. ** Starred sensitivity figures are our estimates, based on testing. Having heard these mics on a few sources, I became curious about their frequency response curves. Although most manufacturers have published curves for their mics, we have none for the Seville, and only one each for the R92 and R-101 (which produce two sounds each); furthermore, because there are no standards for measurement distance or technique, graphs from different manufacturers might not be meaningful when compared. I had a unique opportunity here to test all these mics under identical conditions. I set up a treated space (not anechoic, but good enough to produce consistent results, at least above 1kHz) and calibrated my test rig with a measurement mic. While these results might not match 3rd-party lab verification, they are very useful for comparisons among this group of mics. As a sanity check, I tested two N22s and two R-101s, and the results for each pair of mics were essentially identical — the traces overlapped almost perfectly, with less than 1dB variation when there was variation at all. This suggests that the testing methodology is repeatable (and further than AEA and Royer Labs are delivering very consistently voiced ribbon microphones). At the other extreme, the front side of the R-101 is scooped in the 8–14kHz range. I tested two of these mics at two different distances, with consistent results. The mic’s offset ribbon design seems to have a nontrivial impact on the frequency response. We’ll look more closely at this mic below. My measurement of the AL39 matches the official version pretty closely through about 11kHz; the mic is nominally flat through that point. My measurement shows a 10dB scoop centered at 15kHz. The factory graph shows only a 5dB scoop, with a rising frequency response above 20kHz — no small feat for a ribbon microphone! Now let’s look at the lows. Standard disclaimer: measuring low-frequency response accurately is even more difficult than testing high-frequency response, due in part to the very long wavelength of low-frequency sounds. Nonetheless, for gross comparisons across mics, I think these results are useful, at least insofar as to say that mic A has more or less low-frequency response than B. The Seville and the Model 2 have the most pronounced response in the lows. 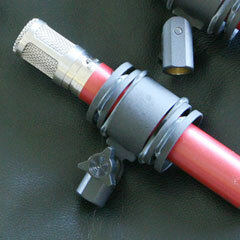 And indeed, both microphones get a bit thick when used very close to a source. At distances of 6-10 inches, the Model 2 sounds more balanced than the Seville, due to its boosted highs. The Seville retains more of a dark, vintage ribbon character at all distances. Compare these to the N22, which is designed to be used close to a source. I wondered if it would appear boosted in the highs, because at traditional ribbon-miking distances (for example, anything over about 10 inches), the mic sounds a bit thin. But it apparently isn’t a boosted top end that creates this effect. Rather, it is the rolled-off lows. This curve helps prevent proximity effect from overloading the low frequencies, and allows the mic to remain balanced when positioned close to a source. Let’s take a closer look at the two ribbons with an asymmetrical response, the R-101 and R-92. Because these mics sound different from the rear side than the front, they are less useful in mid-side or Blumlein configurations, in which you’d want consistent response from front and back. But they are more useful in mono applications, simply because they provide two different sounds. As Royer Labs puts it, their R-series mics are “two microphones in one;” if one side doesn’t sound right on a particular source, just spin the mic 180° and try the other side. The AEA R92 achieves a subtly different frequency response through the use of passive filter material. I don’t know the specifics, but I believe the rear half of the acoustic cavity has additional absorption and/or reflective materials, which cause some frequencies to be attenuated and others to be boosted. The result can be seen in the graph: the rear side exhibits a broad 2dB scoop, from 7kHz–13kHz. The front side gives a flatter response through this region, and on my voice tests is audibly brighter as a result. But the rear side is actually boosted above 15kHz; for sources with content in that range, the rear side could sound brighter than the front. The Royer R-101 uses Royer’s patented “offset ribbon” design, in which the single ribbon element is positioned slightly toward the front of the mic, in relation to the magnets within the ribbon motor. This gives higher SPL handling from the front side, and, according to my tests, a wildly different high-frequency response. The back side of the R-101 exhibits a smooth rolloff in the highs. It begins at a lower frequency than some of the other ribbons in the test, but has a flatter slope. In contrast, the front side has a deep cut in the 9–13kHz range — interestingly enough, in precisely the range that so many cheap condenser mics are boosted. If your other mics are plagued by an abundance of 10kHz, put up an R-101 and you’ll hear a wonderful contrast. I chose three working distances to illustrate how these microphones respond to proximity: 12 inches, 8 inches, 4 inches. In all cases, I measured the distance from the ribbon itself — that is, from the centerline of the mic body — rather than from the front of the mic housing. 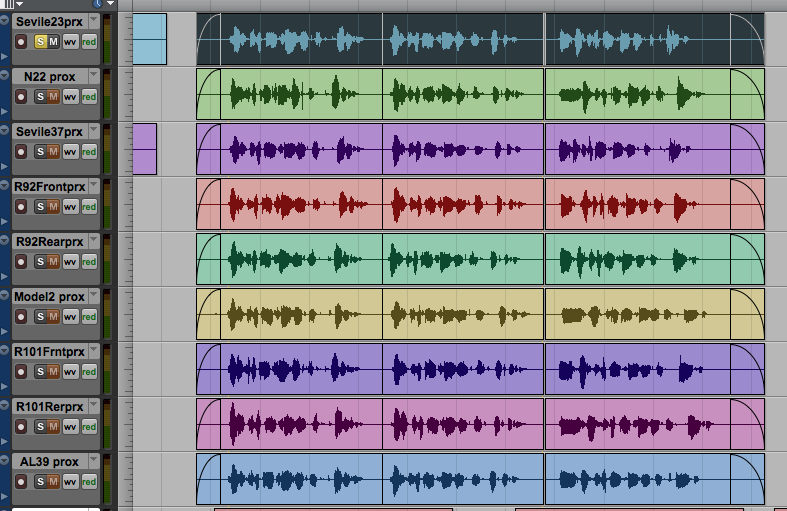 After recording each sample, I gain-matched them all to the same RMS level. The clips you hear are all consistent in level, but you will hear how the low-frequency content increases as the working distance decreases. In addition to the increase in lows (below 300Hz), you’ll hear that the 12-inch clips have more noise. Noise is a natural result of recording a relatively quiet source (e.g., a speaking voice) from a relatively long distance via a low-output ribbon mic. Even the active ribbon models are not very sensitive. Although the signal chain was as pristine as we could make it, adding lots of gain digitally via Pro Tools results in an equal amplification of whatever noise was in the track. You will also hear more of the sound of the room in the 12-inch clips. Just as proximity effect is a natural consequence of close mic placement, ambient sound is a consequence of distant mic placement. Both these effects are factors that must be considered when using any microphone, but especially when using low-output ribbon microphones. For example, if your mic sounds best when positioned far from the source, you’ll also be recording a considerable amount of room sound, and you’ll probably need a lot of preamp gain, which can add noise. Proximity, signal level, noise, and the mix of direct and ambient sound are all part of the mix, and should be evaluated during the mic selection and placement process. The “sweet spot” varies not only with microphone, but also with source and room. But I think it will hold true that the N22 sounds best, and should be used, close to a source, while mics like the Seville are happier further away. The rest of these fall in between the extremes. It is also worth noting that a change of 1–2 inches can yield significant results. Ribbon microphones tend to have pronounced proximity effect, which can give them a narrow sweet spot — meaning, a short range of working distances for any given source in which the proximity effect gives a balanced, rather than muddy result. Manufacturers generally do not provide self-noise specifications for passive microphones. But that does not mean that passive microphones do not produce noise. Any source of resistance can create noise. The noise of the ribbon element itself is multiplied by the square of the ratio of the step-up transformer. The quality of the contact between the ribbon element and its clamps, including contamination or oxidation at that junction, will contribute to the noise. Needless to say, the electronic circuits in active ribbon microphones can also be a source of noise. While we haven’t found any of these microphones to be noisy, we thought there would be value in comparing the relative noise levels across all the mics. 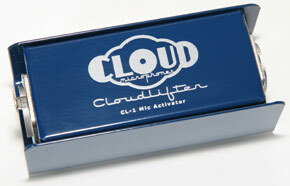 For the passive mics, we used a Cloudlifter CL-1 to boost the signal level with very clean gain (see our CL-1 review for details). We ran that into the quietest preamp channel here, a BLA-modded Digi 002 Rack (see our controversial review of that). For the active mics, we skipped the Cloudlifter (because the Cloudlifter does not pass phantom power) and plugged each mic straight into the 002 Rack. We used the same XLR cable and input channel for every mic. We stood each mic exactly 30 inches from a speaker playing a 1kHz tone. Mic height was standardized, with the middle of each ribbon centered on the speaker cone (60 inches from the floor). We adjusted preamp gain so that each mic was within 0.1dB of each other in the DAW. (The target level was -10dB.) 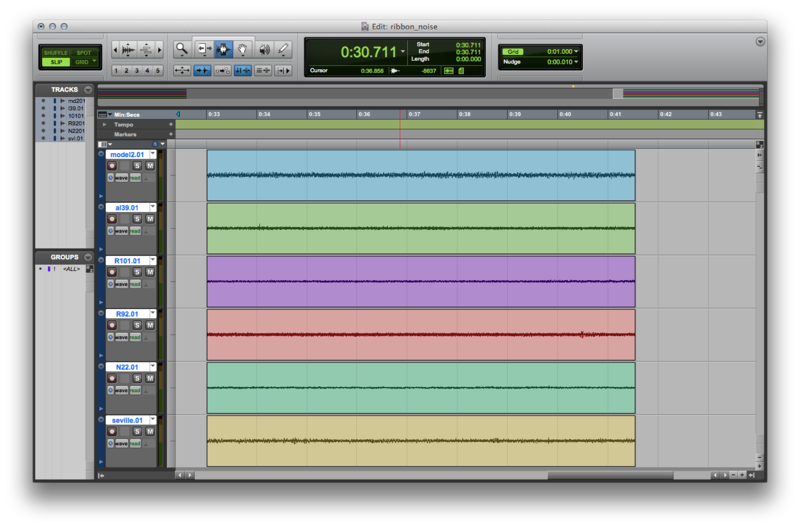 We recorded the test tone so we could verify and normalize levels later. Once the mic’s signal level was as close as we could get to our target input level, we placed the mic into a foam-lined chamber, floating on Sorbothane feet for isolation, on a floating floor, within a mostly soundproofed room. Then we recorded silence for 10 seconds. The “silence” tracks were gain-matched according to the variations in the test tone levels: two tracks were brought up by 1/10dB, and one by 2/10dB. Finally, we measured the RMS level of the “silence” tracks, avoiding any transients that were visible in the track. Transients would have come from ambient noise that had gotten into the mic despite our precautions. The results are shown as offsets from the quietest mic of the bunch, the AEA N22. While I would not characterize any of these mics as noisy, this test suggests that, all else being equal, the Model 2 would have a higher noise floor than the N22, by about 8dB. But, again, the absolute noise level depends almost entirely on your signal chain, and the distance from the mic to the source, and the needs of the production. If you’re putting a mic on a speaker cabinet, you’ll never hear its self-noise. But if you’re putting up a room mic for a solo piano recording, then self-noise would probably be a concern. Having now spent about 40 hours in the lab, we’re ready to start actually hearing these mics on some sources… stay tuned. I have a couple of criticisms of your testing procedure. an R-122, which supports the contention about the noise. 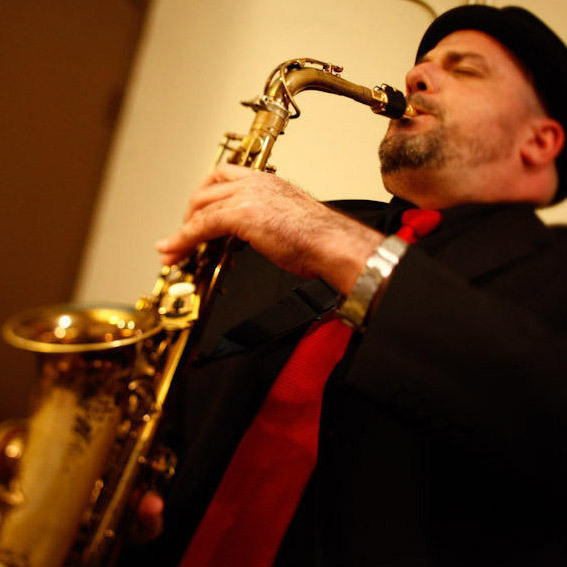 off-axis– the resonators used in that microphone design add another variable to the equation. Would love to see an update with the RODE NTR added.